The Italian Heritage Parade celebrated its 150th anniversary in 2018. Originally called the Columbus Day Parade, the name was changed in 1994 to celebrate accomplishments by all Italians. It is one of the oldest celebrations and originations dedicated to Italian-Americans in the United States. It has also expanded to include floats and demonstrations of the nearby neighborhoods, bringing the whole area together. The parade ends after passing by the reviewing stand in front of Saints Peter and Paul Church on Washington Square. Food and drink are readily available at this free event, and a large display of Ferrari's await you in the Square. 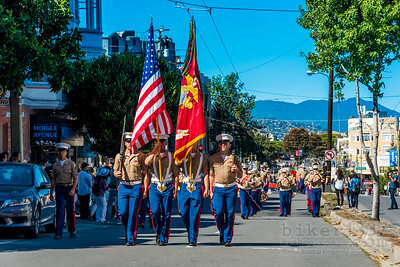 United States Marine Corps Honor Guard leading the parade. The Italian Heritage Parade celebrated its 150th anniversary in 2018. Originally called the Columbus Day Parade, the name was changed in 1994 to celebrate accomplishments by all Italians. It is one of the oldest celebrations and originations dedicated to Italian-Americans in the United States. It has also expanded to include floats and demonstrations of the nearby neighborhoods, bringing the whole area together. The parade ends after passing by the reviewing stand in front of Saints Peter and Paul Church on Washington Square. Food and drink are readily available at this free event, and a large display of Ferrari's await you in the Square. 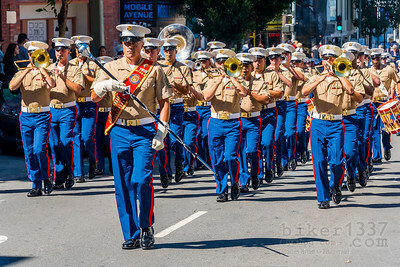 The United States Marine Corps Marching Band leading the way for the parade. The Italian Heritage Parade celebrated its 150th anniversary in 2018. Originally called the Columbus Day Parade, the name was changed in 1994 to celebrate accomplishments by all Italians. It is one of the oldest celebrations and originations dedicated to Italian-Americans in the United States. It has also expanded to include floats and demonstrations of the nearby neighborhoods, bringing the whole area together. The parade ends after passing by the reviewing stand in front of Saints Peter and Paul Church on Washington Square. Food and drink are readily available at this free event, and a large display of Ferrari's await you in the Square. 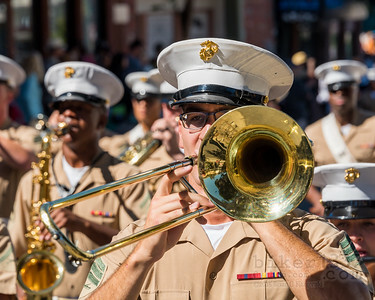 A Marine playing the Slide Trombone as the USMC Marching Band leads the parade. The Italian Heritage Parade celebrated its 150th anniversary in 2018. Originally called the Columbus Day Parade, the name was changed in 1994 to celebrate accomplishments by all Italians. It is one of the oldest celebrations and originations dedicated to Italian-Americans in the United States. It has also expanded to include floats and demonstrations of the nearby neighborhoods, bringing the whole area together. The parade ends after passing by the reviewing stand in front of Saints Peter and Paul Church on Washington Square. Food and drink are readily available at this free event, and a large display of Ferrari's await you in the Square. The Queen riding forth on her throne. 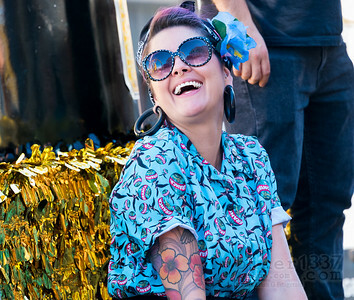 The Italian Heritage Parade celebrated its 150th anniversary in 2018. Originally called the Columbus Day Parade, the name was changed in 1994 to celebrate accomplishments by all Italians. 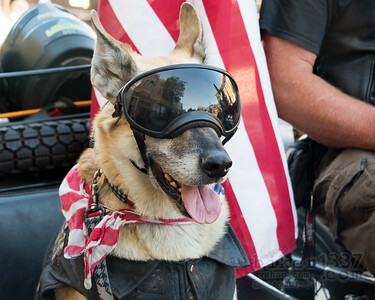 It is one of the oldest celebrations and originations dedicated to Italian-Americans in the United States. It has also expanded to include floats and demonstrations of the nearby neighborhoods, bringing the whole area together. The parade ends after passing by the reviewing stand in front of Saints Peter and Paul Church on Washington Square. Food and drink are readily available at this free event, and a large display of Ferrari's await you in the Square. 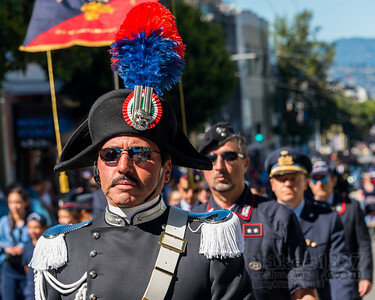 A member of the Associazione Nazionale Carabinieri sez. San Francisco marching. The Italian Heritage Parade celebrated its 150th anniversary in 2018. Originally called the Columbus Day Parade, the name was changed in 1994 to celebrate accomplishments by all Italians. It is one of the oldest celebrations and originations dedicated to Italian-Americans in the United States. It has also expanded to include floats and demonstrations of the nearby neighborhoods, bringing the whole area together. The parade ends after passing by the reviewing stand in front of Saints Peter and Paul Church on Washington Square. Food and drink are readily available at this free event, and a large display of Ferrari's await you in the Square. 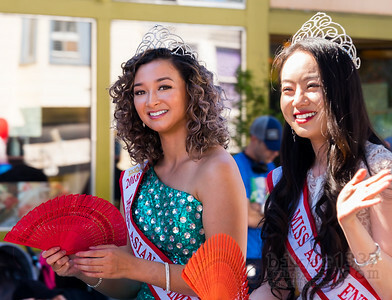 Winners from the Miss Asian Community contest showing off their tiaras. The Italian Heritage Parade celebrated its 150th anniversary in 2018. Originally called the Columbus Day Parade, the name was changed in 1994 to celebrate accomplishments by all Italians. It is one of the oldest celebrations and originations dedicated to Italian-Americans in the United States. It has also expanded to include floats and demonstrations of the nearby neighborhoods, bringing the whole area together. The parade ends after passing by the reviewing stand in front of Saints Peter and Paul Church on Washington Square. Food and drink are readily available at this free event, and a large display of Ferrari's await you in the Square. 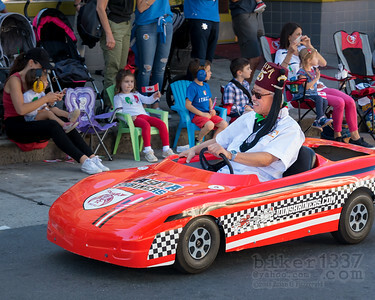 It's not really a parade unless the Shriners break out the mini-cars. Zoom Zoom! The Italian Heritage Parade celebrated its 150th anniversary in 2018. Originally called the Columbus Day Parade, the name was changed in 1994 to celebrate accomplishments by all Italians. It is one of the oldest celebrations and originations dedicated to Italian-Americans in the United States. It has also expanded to include floats and demonstrations of the nearby neighborhoods, bringing the whole area together. The parade ends after passing by the reviewing stand in front of Saints Peter and Paul Church on Washington Square. Food and drink are readily available at this free event, and a large display of Ferrari's await you in the Square. 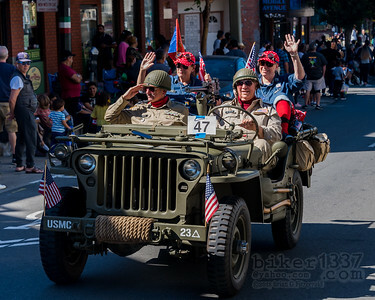 Niner Flydawg Von Raesfeld leading the parade in a Ural sidecar - part of the NorCal Patriot Guard Riders. 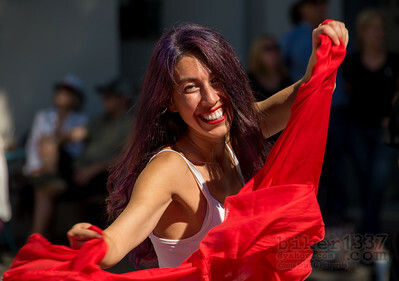 The Italian Heritage Parade celebrated its 150th anniversary in 2018. Originally called the Columbus Day Parade, the name was changed in 1994 to celebrate accomplishments by all Italians. It is one of the oldest celebrations and originations dedicated to Italian-Americans in the United States. It has also expanded to include floats and demonstrations of the nearby neighborhoods, bringing the whole area together. The parade ends after passing by the reviewing stand in front of Saints Peter and Paul Church on Washington Square. Food and drink are readily available at this free event, and a large display of Ferrari's await you in the Square. 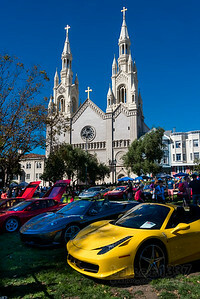 A plethora of Ferraris traditionally cover Washington Square Park during the paraded. The Italian Heritage Parade celebrated its 150th anniversary in 2018. Originally called the Columbus Day Parade, the name was changed in 1994 to celebrate accomplishments by all Italians. It is one of the oldest celebrations and originations dedicated to Italian-Americans in the United States. It has also expanded to include floats and demonstrations of the nearby neighborhoods, bringing the whole area together. The parade ends after passing by the reviewing stand in front of Saints Peter and Paul Church on Washington Square. Food and drink are readily available at this free event, and a large display of Ferrari's await you in the Square. The Queen riding forth on her throne.